Windy City Mechanical, Inc. is proud to serve the Mokena community! About Mokena, IL - Happy to be your hometown Heating & Air Conditioning Contractor! Located in Will County, Illinois, Mokena is a village situated outside of Chicago. As of 2010, the population was approximately 18,700, up from only about 14,500 residents in 2000. The community is served by the Lincoln-Way Community High School District, and students will attend one of three area high schools. Higher education is also provided to community members through Joliet Junior College, which is the country’s first public community college. Rasmussen College also has a campus located in Mokena. 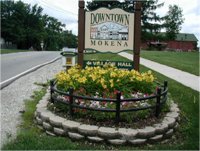 Residents and visitors of Mokena will have several attractions and activities to check out while in this village. Families with young children may enjoy a trip to Jump Zone or to check out the youth programs held at the Environmental Learning Center. The Willow Run Golf Course is a great place to play a round of golf on a warm afternoon, and other outdoor recreational opportunities can be enjoyed at Hickory Creek Preserve or Mokena Park. Other popular destinations in the area include Greg Riley Artwork and DiNolfo’s Banquets. Summers in Mokena are typically hot with high humidity, and temperatures will exceed 90 degrees Fahrenheit more than 20 days per season. This region of Illinois often experiences severe weather systems that are typical of the Midwest, including thunderstorms during the summer and autumn months. When this severe weather and high heat moves into the area, residents are thankful to have reliable air conditioning systems to keep them comfortable. Later in the year as autumn turns to winter, Mokena residents will turn off their air conditioners in favor of a furnace or heat pump. Winters are cold, with daily highs only reaching the mid-20s. Overnight temperatures are even colder, and there will be some days in which the thermostat fails to even reach positive digits. When this dangerously cold weather strikes, it is essential for Mokena residents to have a functional and reliable climate control system in place.